ZSP-1191 is a mastic caulk, forming a soft gasket seal on self-curing. At all such places where leakage free seams & joints are required, it provides a gas-tight, vapour barrier, waterproof & weather resistant protective seal. It possesses good adhesion with all types of wooden, metallic, plastic, glass, R.C.C. surfaces. 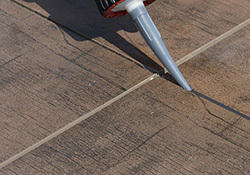 In Civil Construction, ZSP-1191 is used as joint and crack sealant for both indoor and outdoor applications. ZSP-1191 conforms to the requirements of ASTM C920 Type-S. The product is non-toxic, non-hazardous, non-corrosive, non-fungal, non-polluting and safe in handling. Available in various colours in 300g cartridges as well as bulk packages. Unlike silicone sealant, the product does not de-bond with time and can also be painted over.